This comes from the magazine’s “TRICKS OF THE TRADE” section. It isn’t immediately clear at first what boss they’re talking about. 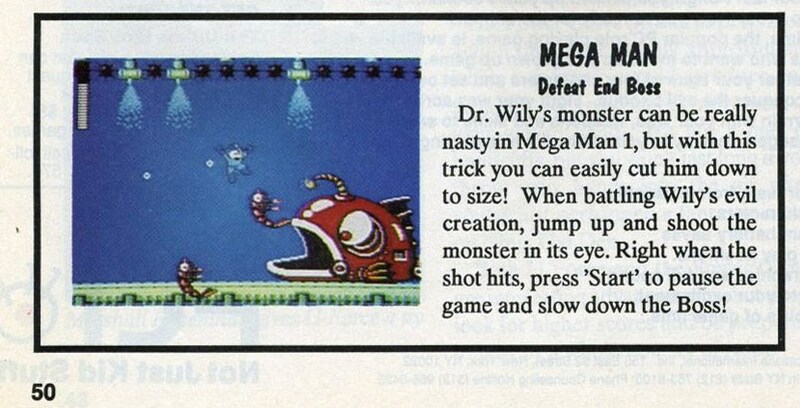 “Defeat End Boss” and “Wily’s Monster” aren’t too specific, not to mention that the screen shot is from Bubble Man’s stage of Mega Man 2 and not related to this tip at all. Towards the end, they mention shooting something in the eye, so it’s probably the Yellow Devil. It doesn’t matter much anyway, the fabled pause trick can work on many of the bosses of Mega Man 1. Only, I know I always used the SELECT button to pull it off. With opening and closing the menu each time, using the START button would be pretty clumsy… If it works at all, that is. Actually, this just says it’ll slow down the boss, it doesn’t mention that it’ll do extra damage with each well-timed unpause. That much is true, pausing will slow the boss, and everything else in the game for that matter. Thanks for the tip, classic EGM! You make excellent blog filler. We’ll try to have something more substantial up for you guys tomorrow, when Monday and Friday posts collide! As always, you can find more 20th century historical gaming documents at Retromags! 1 Comment to "Thanks for the Tip"